Here's a famous couple. You probably already know quite a bit about the guy on the right, but I'll bet you don't know who created the fellow on the left. He was designed back in 1952 by another famous couple: Martin and Alice Provensen. 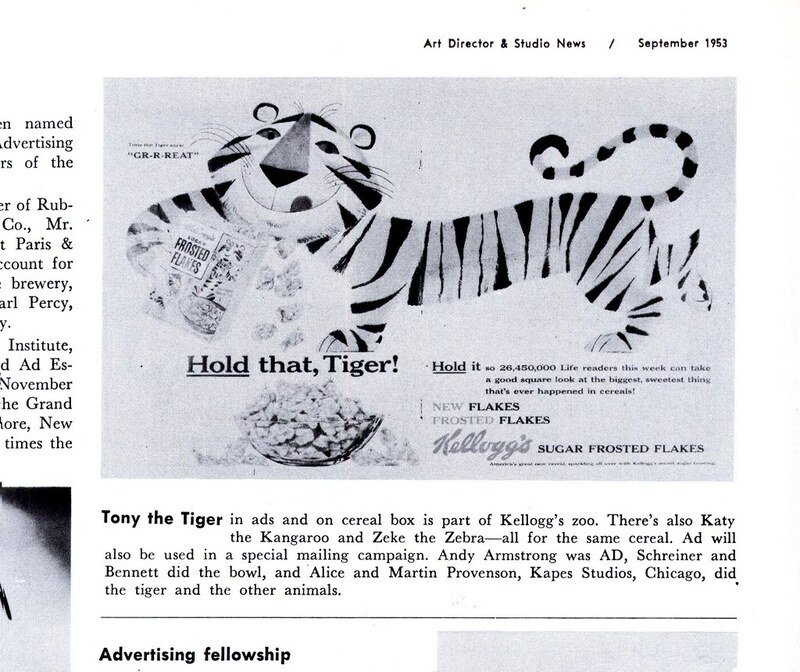 Tony the Tiger's birth was noteworthy enough to make it into the news briefs section of the September 1953 issue of Art Director and Studio News. 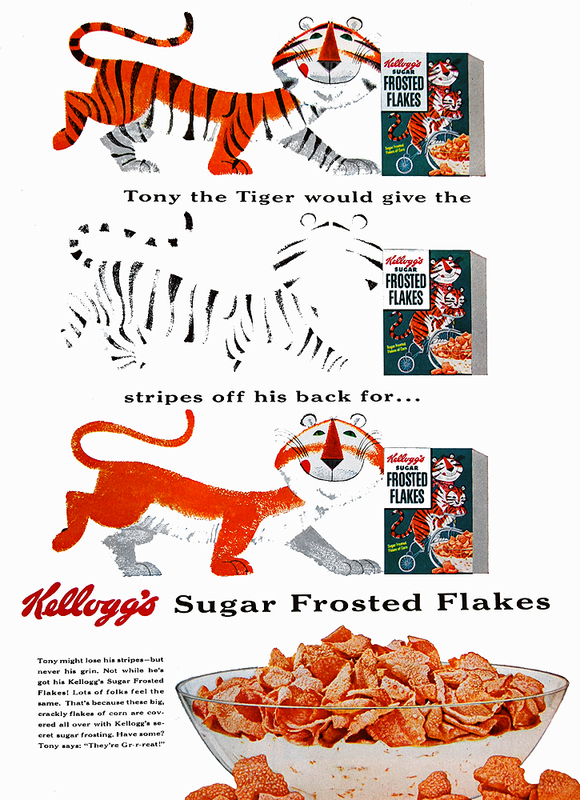 The short piece mentions that Tony was not the only cartoon mascot intended for Kellogg's Frosted Flakes. There was also Katy the Kangaroo and Zeke the Zebra, and from doing a little research I discovered that Elmo the Elephant and Newt the Gnu were also under consideration. 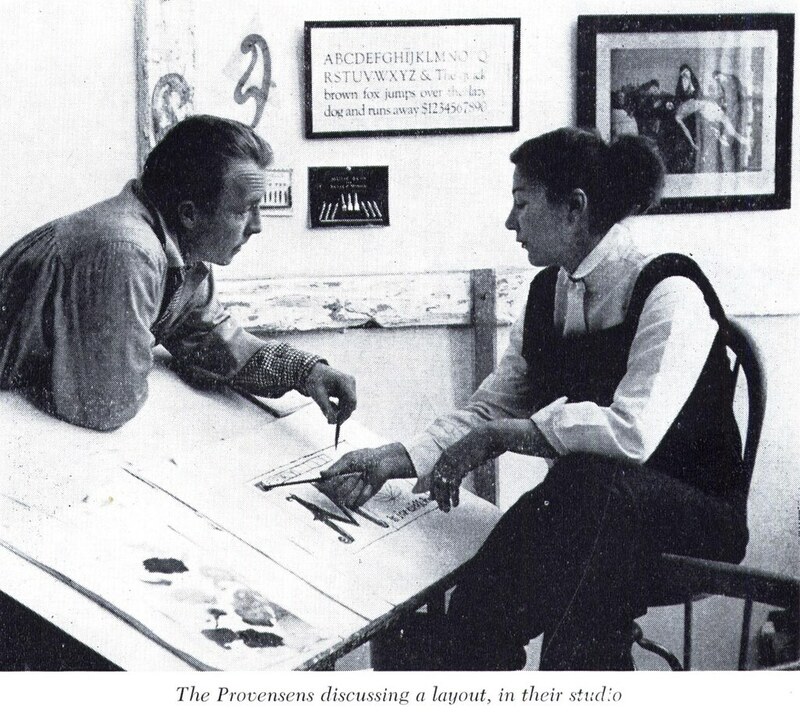 The article further states that the Provensens worked for Kapes Studio in Chicago. I managed to turn up a late 1952 ad for Kapes - and although it lists what artists the studio repped, Alice and Martin are not among them. Perhaps they joined Kapes at some point early in 1953? We can only guess. 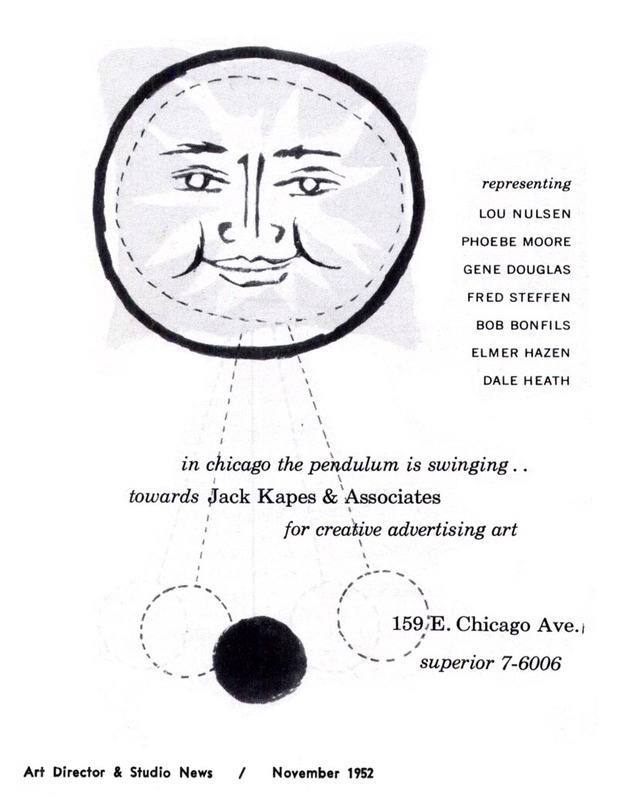 But being relatively new in the business, it seems a safe bet that Jack Kapes or one of his sales reps (if he had any) can take the credit for showing the Provensens' portfolio to the Leo Burnett agency and landing them this plum assignment. And plum it was! 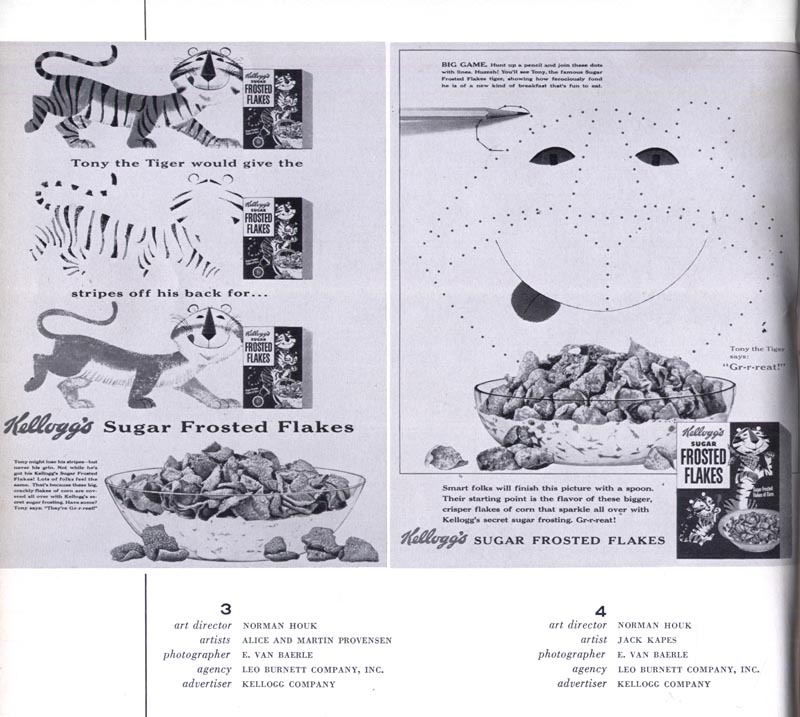 The Provensens, more used to the lower-paying fees of the childrens book market, must have earned some lucrative commissions from the extensive magazine ad campaign Kellogg's rolled out for Frosted Flakes. Along with some decent ad dollars, Tony provided the Provensens with some decent exposure: the illustrations the Provensens created of Tony earned them their only inclusion in the New York Art Directors Club Annuals of the 50's decade. 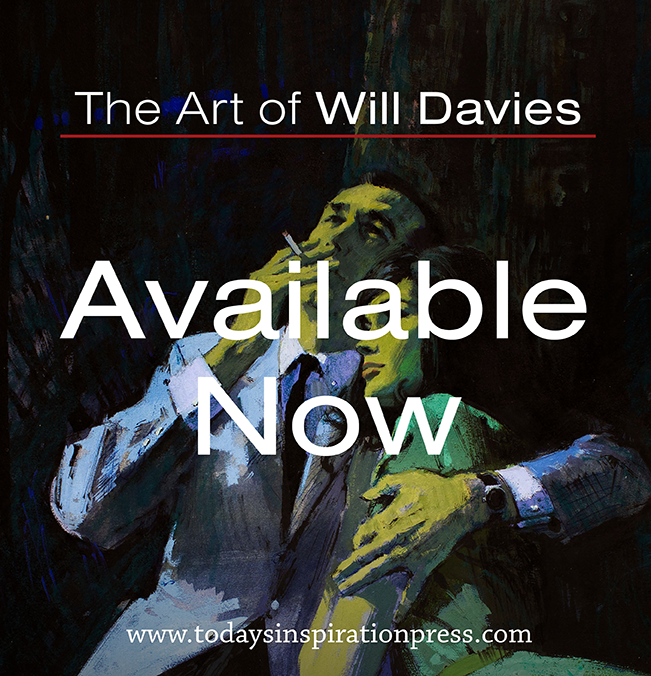 The two ads below were presented at the very front of the "Ad Layout" section of the 1955 AD Annual. That makes them practically the very first visuals you see as you open the book. I'll bet that didn't hurt the Provensens' reputation! If you hunt around the Internet, you'll probably find the odd picture of Tony's old friend, Katy the Kangaroo. But what ever became of all the other Provensen critters from that early "Kellogg's Zoo" is a mystery. They seem to have... disappeared. "Just a little note from Alice and Martin's nephew....they INVENTED Tony the Tiger, and Katie the Kangaroo for Kelloggs, I should know, I, and my little brother in the early 50s were part of a childrens group brought together to access which charters we liked best. Tony and Katie were the winners.........Erik Provensen"
* My Alice & Martin Provensen Flickr set. 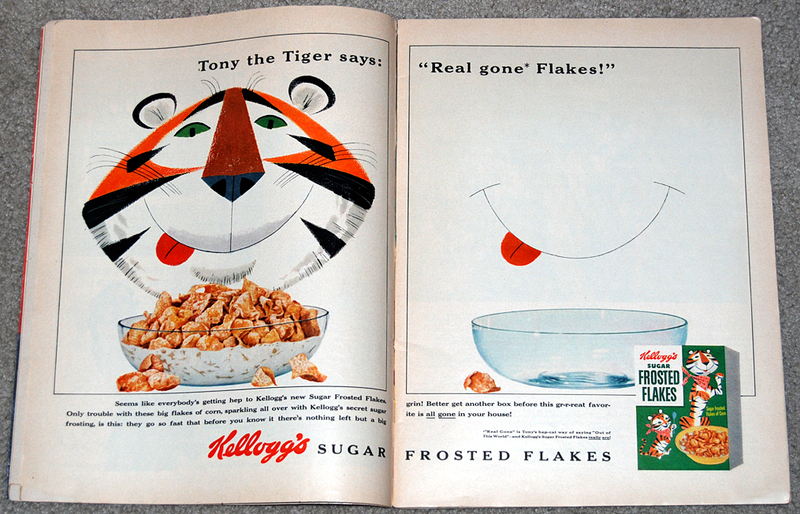 * Many thanks to Flickr friends Roadside Pictures and Wishbook, who generously shared their Tony the Tiger scans for todays post! 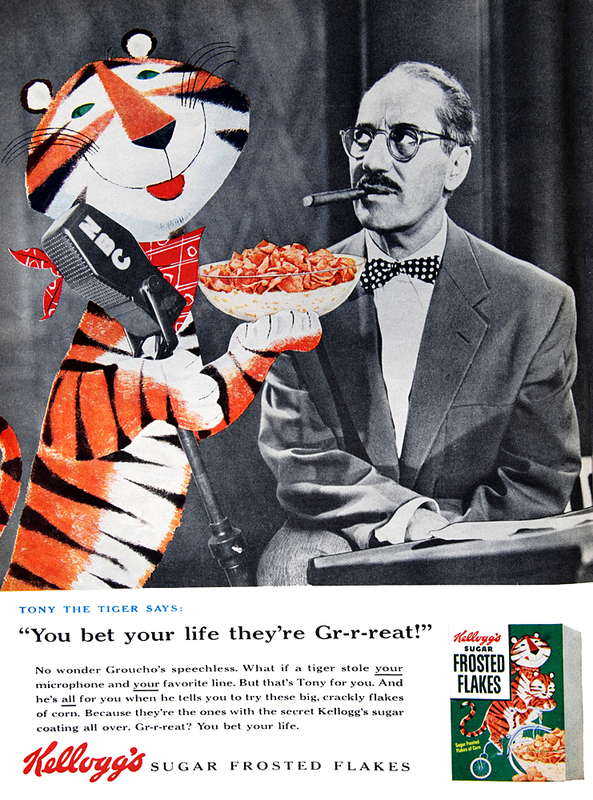 Tony the Tiger is such a pop culture fixture. A brilliant use of ad dollars. Thanks for the info about him! The Provensens are right there at the top of the heap of favorites for me. Thanks for posting this, Leif!! For me, "The Color Kittens" is their greatest work, indelibly painted upon my memory from childhood and now transmitted to my own children. i know this is an old post and i know my source of information at the moment has been only wikipedia.. but i'm sure that, the way it reads, Tony the tiger was actually replaced by his son Tony Jr. for all of the modern day advertising..
as i said I'm yet to find any solid evidence of this but still.. i thought it was just the same character but constantly re-styled as many others are..
i'm actually a little shocked. Also.. hoping yourself or other Tony fans may shed some light on this. Cool... yet, not as cool as Seventh-Heaven which I went to.